1. Soak the sun-dried tomatoes in hot water for 10 to 15 minutes and drain well. 3. Add the mushrooms and saute for 2 minutes. 5. Grind together the sun-dried tomatoes, chopped tomatoes, ginger and garlic to a coarse paste. 6. Add soy sauce, lemon juice, lime juice, cardamom powder, red chilli powder, cinnamon powder, clove powder, cumin powder, coriander powder and brown sugar. 8. Place the chicken breast fillets on a baking tray. 9. Add the mushrooms and pour over the tomato mixture. 10. Place the tray in a preheated oven at 200C/400F for 20 minutes or until the chicken is cooked. 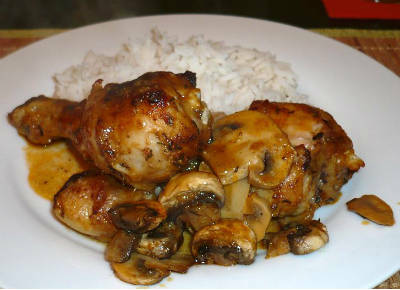 Feel free to comment or share your thoughts on this Baked Chicken and Mushrooms Recipe from Awesome Cuisine.